I had not had a chance to go back to Roan Mountain this year. 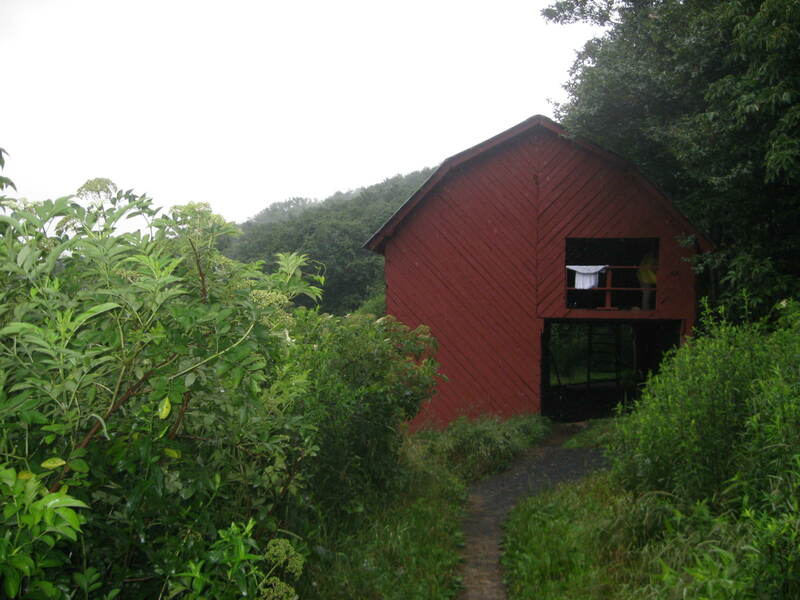 This is one of my favorite places – and I had many more miles of the Appalachian Trail that crosses it to explore. My plan was to drive to the end of the Roaring Creek Road and access the trail via the Forest Service road that continues past the gate and up to Yellow Creek Gap. 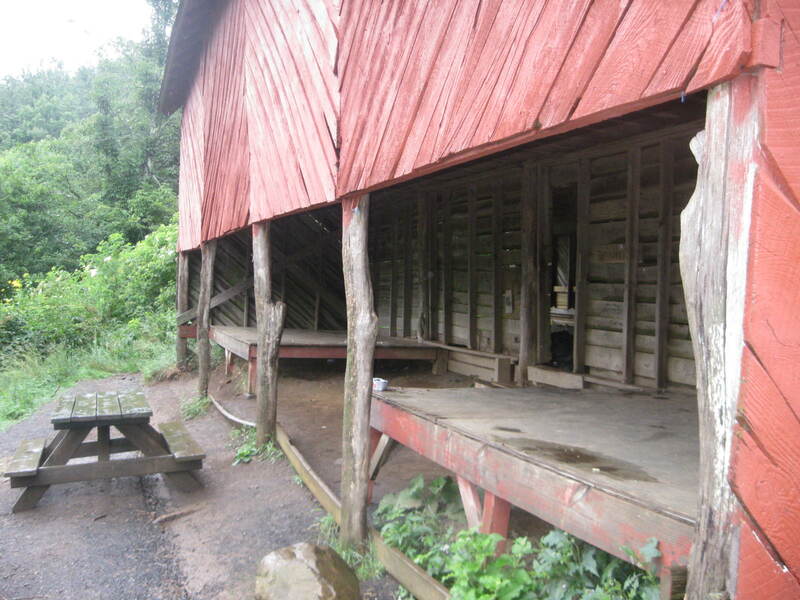 My base camp would be at the Overmountain Shelter – a barn that has been renovated and converted into a trail shelter. 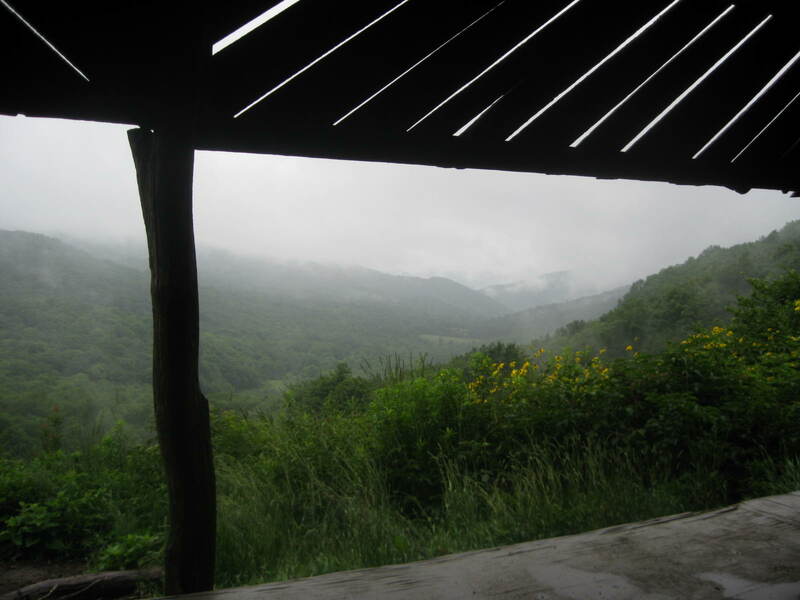 The shelter is one of the nicest on the trail and has one of the best views from any shelters that I have visited.The drive up to the Roan was uneventful with just a few drizzly drops of rain. I found the turn-off to Roaring Creek Road – there no street sign – and followed the road up the creek valley. The road turned from paved to gravel about 1/2 way up. I continued up and eventually reached the small parking lot – big enough for 6-7 cars – and prepared for the hike. There was some misty rain and cloud at the 4200 ft elevation of the parking lot. There is access to the Overmountain Historical Trail from this lot. I passed the gate and ascended up the very forest nice road to the Overmountain Shelter. The distance from the parking lot to the shelter is about 0.7 miles with a 350 ft ascent. There are several springs along the road with a nice piped spring just below the road at the junction with the shelter access trail from the AT. The water is marked by a dark blue blaze trail and the shelter access trail is blazed with light blue. 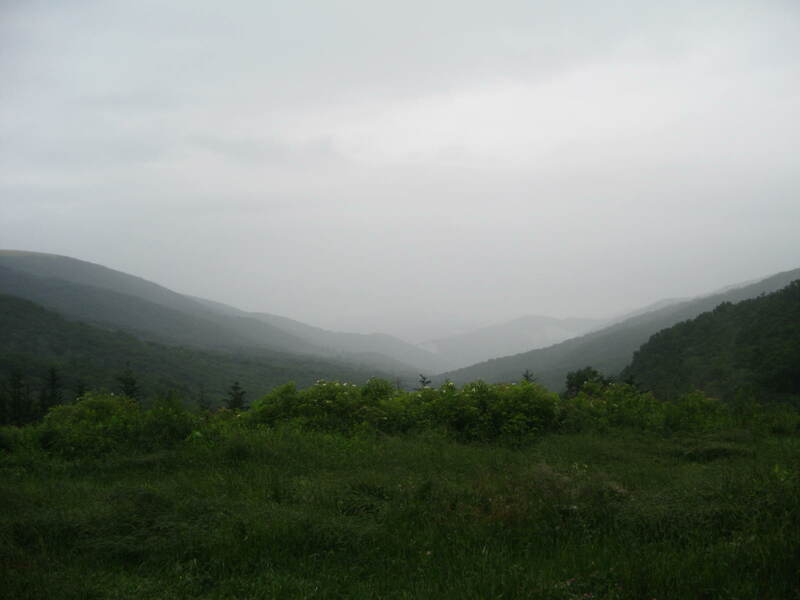 The shelter is at the top of a nice meadow that affords views down the entire Roaring Creek Valley. I stopped in at the shelter to see who was there and to make sure that I knew where it was when I completed the day’s hike. There was already a fairly large crowd here that was enjoying the shelter because of the increasingly bad weather I was encountering as I gained elevation. I decided to head out and proceed with my hike. My plan was to hike northbound out of Yellow Mountain Gap and go to Hump Mountain 4 trail miles distant and return to the shelter. The path would take me over Yellow Mountain and Little Hump Mountain. I left at the same time as another hiker his trail name was Puma Ghostwalker. We would share the hike out to Hump Mountain together. He is a naturalist and teacher from New York City. He was walking from Springer Mtn in Georgia and was hoping to reach Harpers Ferry, WV by September. He has been documenting his journey by photo and video. I realized after a short time that I had crossed paths with him before! We passed each other in just as he started Georgia back in May. He was heading north toward Blood Mountain and I was headed south towards Woody Gap. Sometimes the trail can be a very small place. We passed a Boy Scout troop heading down the the shelter for a rest break as we headed out. The initial ascent out of the gap was very steep, but followed the edge of a very nice bald following the ridgeline. 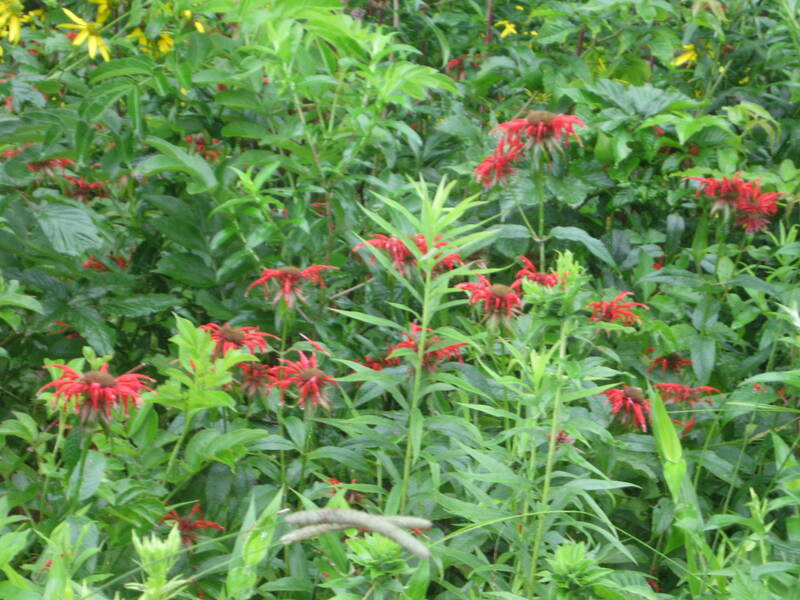 There was an abundance of wildflowers including Bee Balm, Rudbeckia, Daisies and many others. The trail leveled a bit and passed through a small patch of forest along an old woods road. 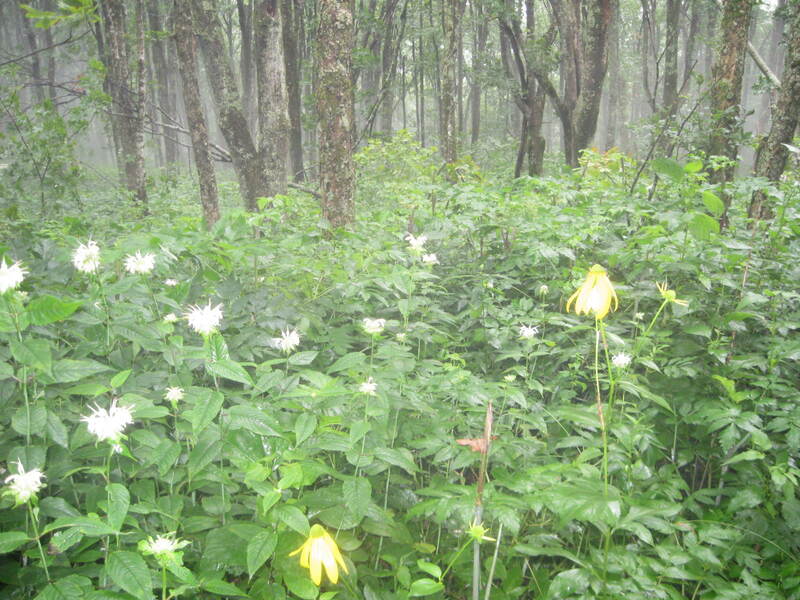 The forest was made up of Yellow Buckeye, Beech, Birch, and Crab Apple at the high elevations – 5000+ ft. 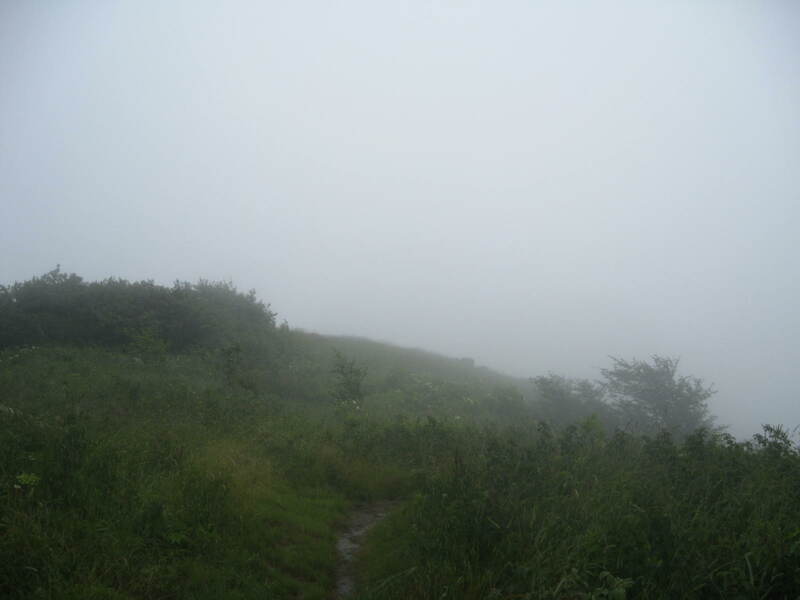 The weather continued to get worse as the trail continued to climb. After leaving the woods the trail opened out onto the open grassy bald of Little Hump Mountain. The rain was coming down in sheets in 20 mph wind as we crossed the bald. My feet were soaked already and I had only been hiking a short time. Puma Ghostwalker had been in this mess for the past few days and was thoroughly soaked. He was headed to the Mountain Harbour B&B at the US 19E road crossing to dry out. We managed to get across the summit and headed back down through the next gap. Again there was a nice forest with some very nice campsites and water available on side trails as we crossed through the gap. We left the forest in the gap and back out into the balds. There was a large area where the grass and small woody trees had been cleared. A large area was bushhogged and cleared. It must have taken a long time to do all this work. The ascent to Hump Mountain was fierce. More wind and rain with the added aspect of a steep climb. There were several large rock formations along the climb and the trail passed through a falling-over stile as it got closer to the summit. The Hump Mountain bald is home to some longhorn steers that graze here during the summer. Puma stopped to film a video and I continued up to the summit. I was hoping for extensive views but today only could see about 100 feet into the clouds and fog. I was now thoroughly soaked I was ready to head back to the shelter. 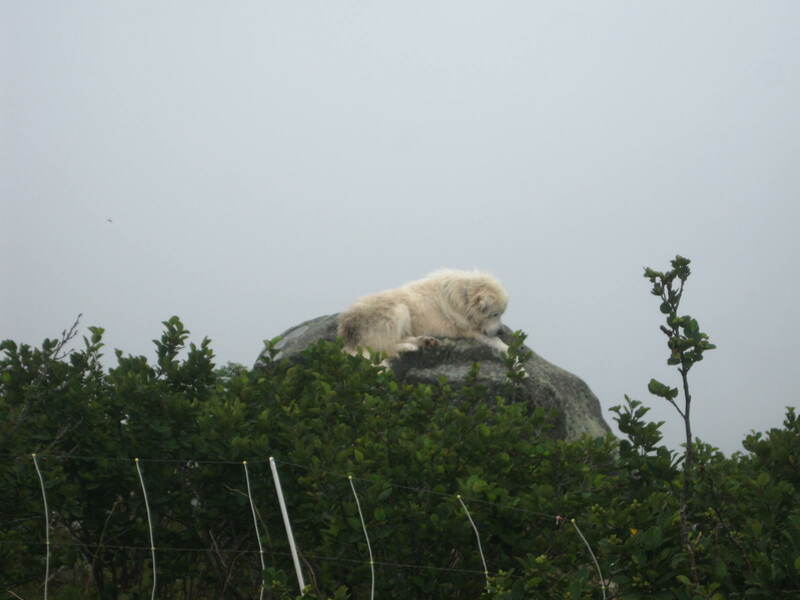 I passed by Puma on the descent and I wished him well on his journey. I will link to his video of this day after he posts during his next town visit and resupply. Thoughts of warmth and dryness kept me going as the hike continued. I passed the Boy Scout troop again as they continued their hike to Doll Flats beyond Hump Mountain. The rain abated a bit and I stopped to eat lunch in the gap between Little Hump and Hump Mountain. The energy boost from lunch kept me going and I started to feel better. The rain also let up a bit and the hike over Little Hump was no problem. I descended back down to Yellow Mountain Gap and back to the first bald. This time the view was opening up and I could see the barn shelter in the valley. I settled in, changing in to dry clothes, shoes and setting up my hammock for the night. The barn was spacious and I was able to hang my hammock up in the loft. There was a nice downstairs which had more space to spread out with a nice porch to cook out on. I made some Jerk Chicken and Rice and warmed myself back up. The other shelter visitors napped upstairs in their sleeping bags to stay warm in the low 50 degree temps of the late afternoon. I grabbed my e-book and read the rest of The Adventures of Tom Sawyer. Everyone started stirring late in the afternoon as temps rose a bit and the clouds started moving out. There was a nice campfire and everyone’s mood seemed to turn with the change in the weather. The views continued to expand out to the horizon with 4 distinct ridges visible to the horizon – a very nice sunset scene. Twilight closed and the stars came out. As the night darkened I headed up to be around 10. Hanging out in the hammock was great – a lot better than sleeping on the hard floor. I woke the next morning around 6:30 and started some water to heat up my breakfast. The morning’s weather was not as clear as the evening before would have indicated. The shelter was fogged in again. I made a dehydrated egg pack with potatoes and sausage. It was o.k. but I could not finish it. At least it was energy and would be needed for the day’s hike. The remainder of my hot water was used for some instant coffee. I packed up my gear and prepared to depart. Last stop before leaving was at the spring to fill up before heading up the mountain. 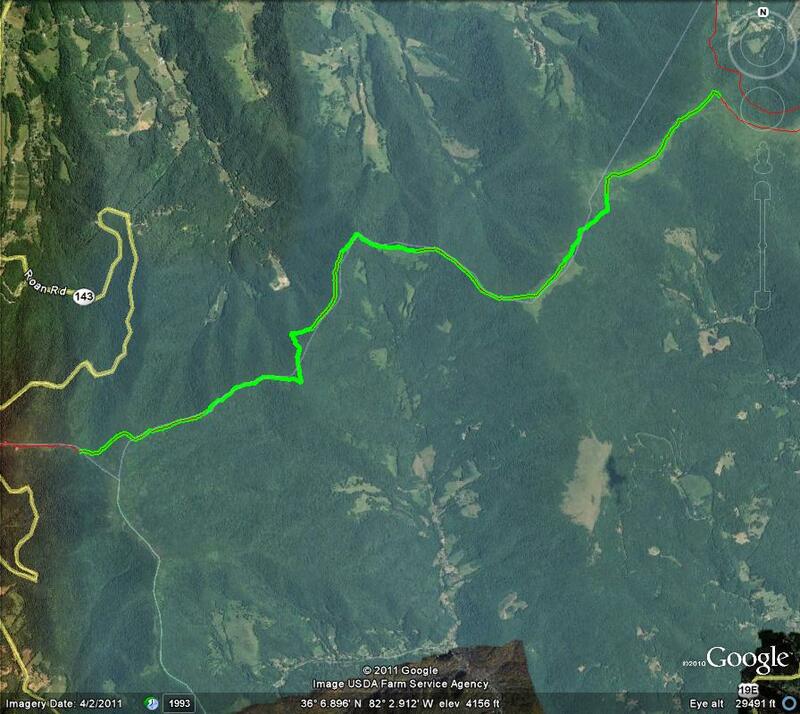 The hike would take me up to Grassy Ridge Bald 3.3 trail miles south and 1400 feet up. The trail ascended through the beech forest reaching the ridge line above. The forest floor was again covered with a sea of wildflowers. In the misty morning fog it was a very nice scene. The trail was pretty slick and took a bit of effort to keep good footing. I was lucky not to slip on the way up. There were deer tracks all along the trail – many showed them slipping along. 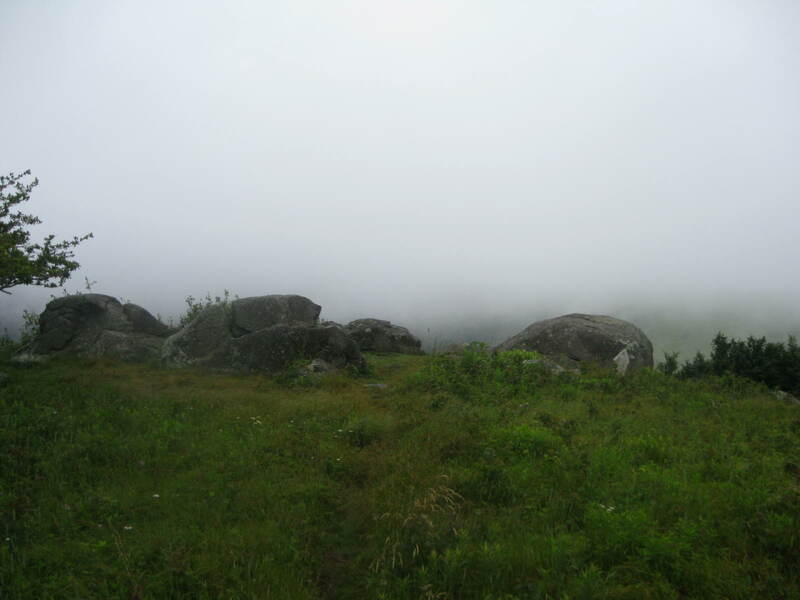 The trail opened out onto a small bald and I could see the hint of the ridge of Grassy Ridge Bald through the fog and clouds. The trail descended into a small gap where the Stan Murray shelter was located. This shelter is one of the smaller ones I have seen on the trail – holds 4-6 hikers and has a picnic table and a spring which is located 150 yards below the shelter on the other side of the trail. If I had the choice of the 2 shelters I would definitely stay at the barn! The trail continued up over a number of switchbacks as it headed up and around the end of the Grassy Ridge Bald. The forest thinned out as it continued up. The fog thinned as I ascended and there were hints of good views available at the top. There was some recent maintenance on the trail and I was grateful that the weeds had been cleared from the trail. I stopped at a rock 1/2 a mile short of the trail junction to Grassy Ridge and did some maintenance on my feet. It felt good to take a break and make sure that I did not develop any blisters. The remaining hike to the top went quickly and the trail opened out onto the grassy balds on top of the mountain. I recognized the spot where I had turned around during my hike on the Roan 3 years before that I had taken with the kids. This was the spot. 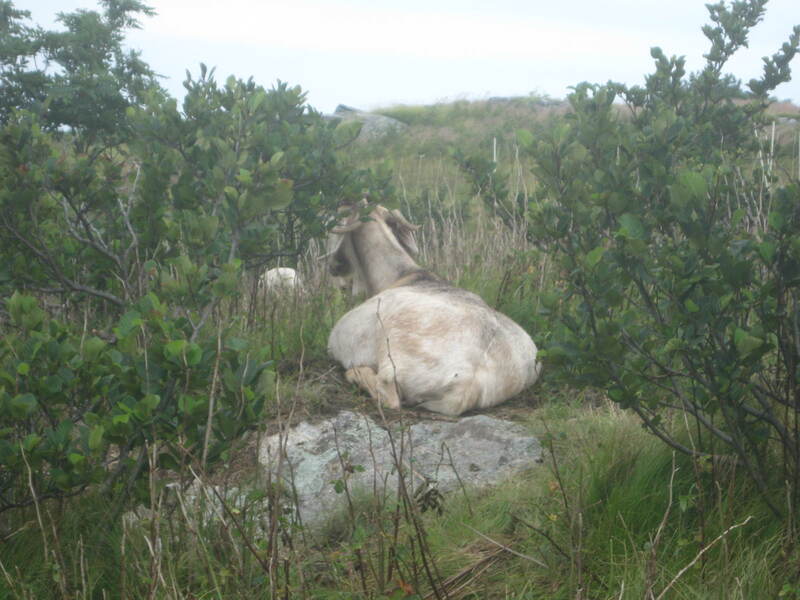 It was a bit different this time however – there is an ongoing project to manage growth on the balds using angora goats. Their pen was guarded by 2 Great Pyrenees dogs. It was just like the old Warner Bros. cartoons with the sheepdog and the wolf. It was a really cool scene. I hope that the project is successful in keeping the balds open with their unique habitats and expansive views. I headed back down the mountain and made quick time on the descent. I managed to hike the 3.3 +miles in just over 1 1/2 hours and made it back to the car in good shape. I will need to come back sometime – hopefully on a clearer weekend!